in the risk of Cesarean. in the use of synthetic oxytocin to speed up labour. in the likelihood of a spontaneous vaginal birth. in the use of medication for pain relief. We hired Natalie because my partner thought it would be a good idea to have back up support during my labour. At the time I had very little understanding of what exactly the role of a doula would be, but after meeting with Natalie I knew we had to hire her. Natalie is so knowledgeable about birth, how to prepare, possible unforeseen outcomes, as well as providing support when you bring your baby home. I credit Natalie’s guided meditation during labour with helping me progress when labour had stalled. Her support after birth helped keep us sane. I’m not sure I would have survived my birth experience without Natalie! I had a long early labour (30 hours) and Natalie was there for me from the time I called her in the middle of the night, until we were settled after the delivery and my baby was latched and feeding! 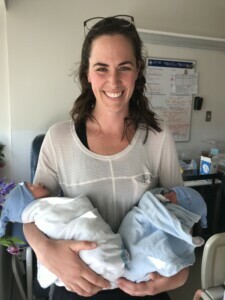 From her calming presence to her coaching me through difficult contractions, Natalie was invaluable during my labour at home, at the birth centre and then later, at the hospital. She helped my husband find the words to be a supportive partner and her pre- and post-natal visits provided us with the additional support we needed. I recommend Natalie to any expecting parents that want a kind, caring and supportive doula. Natalie Edward is a nature and animal-loving yoga teacher, musician, and dedicated mama. She’s committed to providing professional, warm and caring support to families through pregnancy, birth and the first few weeks postpartum. Natalie is a certified Birth Doula with DONA International, experienced, and committed to providing you and your family with the care you deserve for a positive birth experience.